Your ANA is pleased to welcome Diego Villalobos Ramirez as our new Office Manager. 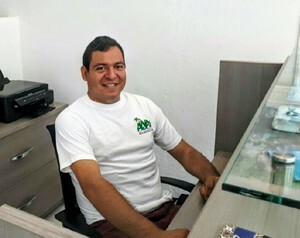 Diego is smart, helpful, agreeable and experienced. Not to mention bilingual. Most recently, he worked as Management Assistant and handled Front Desk responsibilities at Tropicasa Realty. Prior to that, Diego served four years as Front Desk Supervisor-Concierge at Vidanta Mayan Palace, winning Employee of the Year in 2014, and Employee of the Month on six other occasions. Diego will be working with Administrator Viviana Teston to respond to ANA member requests, connect with City Hall, oversee ANA projects and social media, help with New Member and Sponsor Outreach, and handle other administrative matters. The addition of a second full-time employee to our ANA staff means that there will almost always be someone in the office M-F, 9-6, to address your concerns, or answer a call or email. It also means that we can do more than one thing at a time, and ensures that nothing slips through the cracks. Come by and meet Viviana and Diego in our office at 111/3 Rodolfo Gomez, across from The Coffee Cup and Barra Light, in Hotel San Marino. ANA’s growth, new office, great staff, accomplishments, and ability to get things done for Amapas are all thanks to the annual dues and generous contributions of Individual and Full Building Members like you. Welcome Diego! Your smile is infectious.